All products sold in VICTONY will be offered a 30 days' free refund and one year limited warranty. If you have any questions or issues about our products, please contact us freely. When the vehicle parked, the device will automatically start recording when objects moving close to your parked car. The device will automatically start recording when objects moving close to your parked car. To help you park safely, It will automatically show the parking image in full view without pressing any button when the R gear is engaged. 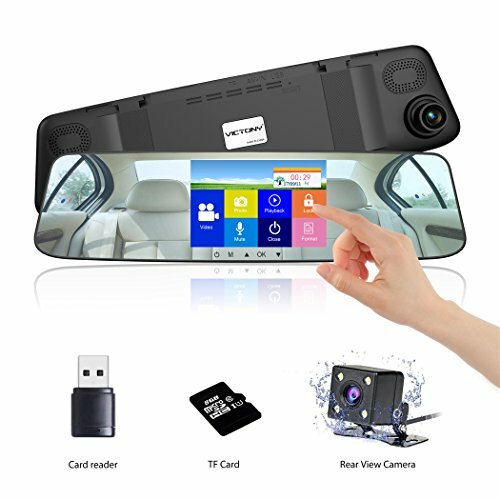 The car video recorder will automatically turn itself on for recording when starting the car and automatic shockproof function effectively avoids fuzzy images. ★ Anti-Dazzling Mirror & Touch Screen Operation Interface: The large 4.3" white screen IPS mirror has surpassed blue screen with better Anti-dazzling performance.With touch screen operation interface,It's very easy to navigate to Menu settings with a fingertip touch.